But, the undisputed winner of the “Holy #$^$%, is this really a thing?” award is: NFL Rush Zone: Guardians of the Core! Before I go and read the Wiki article, let me try to explain what I think I saw. It seemed to be about a group of five kids, the obligatory white guy, white girl, asian guy, black guy, and hispanic guy. They could turn into some kind of football robot thing, each with some kind of signature move. They are called guardians because they guard something. I think it was something called a megacore. There’s one for each team and it has the team logo. There are also things called “rusherz” that are little versions of the team mascot as pokemon*. They’re aided by real NFL coaches and players who teach them lessons and seemed to show some NFL highlights. They’re fighting some sort of evil football players called “Wild Card” and maybe “Sudden Death.” who want the megacore doohickeys for some reason. It’s about a step below the Saturday morning cartoons that tried to make breakfast cereals into TV shows. It’s ham-fisted, patronizing, obvious, and just flat out boring. I’ve seen some terrible television but this is quite possibly the saddest thing I’ve ever seen. 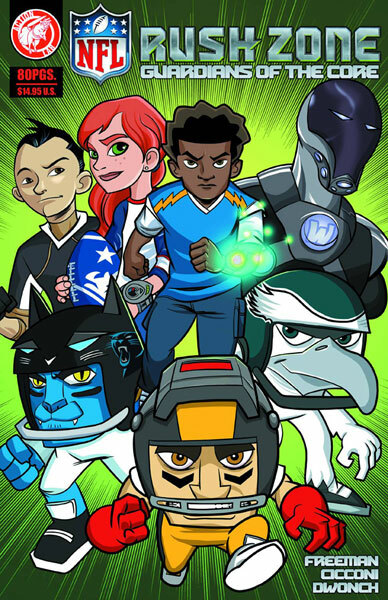 If your idea of fun is watching an advertisement for the NFL pretending to be some sort of kids show, then this is probably right up your alley…and you’re probably not reading this blog…or much anything….ever. * The plural of pokemon is pokemon. Posted in TV.Tagged Bored, Guardians of the Core, NFL, Power's Out, Rush Zone.